For JCats the following information will be entirely redundant, but for those uninitiated few out there (shame on you! ), here a little intro on four-piece Brit boy band Union J. Union J were formed during X Factor 2012 when fate and a little pop-magic stardust brought Josh Cuthbert, Jaymi Hensley and JJ Hamblett of Triple J together with George Shelley. Judge Louis Walsh mentored them in the competition and they ultimately finished in fourth position. Since then, in only a little over a year, Union J have racked up more than 1 million dedicated (obsessed?) Twitter followers and released their sweet, ubercatchy debut single ‘Carry You’, which hit #6 in the UK Charts. Next up is their second single ‘Beautiful Life’, their self-titled debut album in October, an autobiography, and their first UK headline tour ‘Magazines + TV Screens’ in December and January. This is obviously only the beginning of World J-omination! Pop Scoop! 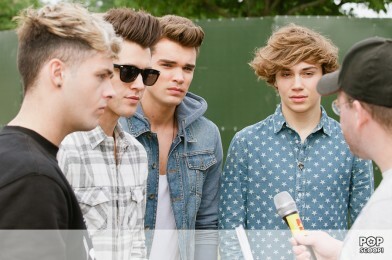 caught the boys for a quick chat before their set at Sundown Festival. They spoke about their hectic schedules, what’s coming up for them over the next few months, their Meet & Greet with our lucky competition winners from Sweden back in July at Sound Island Festival, and even a few sneaky hints about their second album.